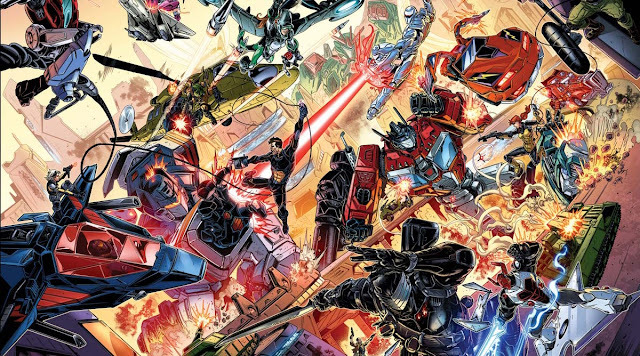 With rumours of Unicron coming to earth in the near future, IDW has justified the revolution which has merged all their Hasbro related titles into one universe. For if he truly is coming, than only the combined forces of M.A.S.K., the Transformers, G.I. Joe, ROM and the Micronauts could stand against him. M.A.S.K. : Mobile Armored Strike Kommand's first ever monthly lands in November, with the team on the run and a first year Fast and the Furious focus on the M.A.S.K. and V.E.N.O.M. characters. (W) Brandon Easton (A) Tony Vargas. Optimus Prime faces the consequences of declaring earth under his protection in his FIRST EVER ongoing series, rolling out this November. (W) John Barber (A) Kei Zama. ROM will introduce new Space Knights in his second story-arc, as humans begin to have a problem with ROM killing people who are actually Dire Wraiths in disguise. Micronauts will remain in the 'real world' initially post Revolution, one where they are only 4 inches tall. Transformers: Lost Light will take Rodimus and the crew of the starship Lost Light into the farthest reaches of the universe this December, searching for the long-lost Knights of Cybertron. (W) James Roberts (A) Jack Lawrence. Transformers: Till All Are One will move into a huge fight, one where even Metroplex will rise and take action. WHAT DO YOU THINK? I have to admit at first I wasn't sure about a shared Hasbro world. I thought it would strengthen some concepts while weakening others. But the more I start thinking about what if the more crazy cool connections I see the merge throwing out. And who doesn't want to see Roadblock opening fire on Unicron? Let's see where this goes!